The branch network is evolving based on banking’s changing economic model as well as changing customer expectations and behaviors. As the branch network evolves measurement of the customer experience within the branch channel will need to evolve as well to fit both the changing economic model and customer behaviors. Branch staffing both decline and change with increased use of “universal” associates who will conduct a wider range of functions, transforming tellers to sellers. The article goes on to describe five case studies for innovative branch design in the United States. Flagship Branches: Hubs to a hub and spoke model offering education, advice, and serving as sales centers. Community Centers: Branches smaller in scope focused on community outreach driving loyalty. Expanded ATMs: These will serve as transaction centers at in-store or other high traffic sites. Consistently delivering on the brand promises despite disparate branch types – Does the customer experience reinforce the overall brand promise? Fidelity to each branch’s unique role within network – Does the customer experience fit the specific role and objectives of the branch? Huge challenges associated with a transformation of skills to universal associates – How do we conduct a massive transition of skills of tellers into financial advisors, fluent in all bank products, and manage these associates fewer less employees on site. The customer experience at flagship branches will best be measured much like it is at traditional branches today with a mix of customer satisfaction surveys and mystery shopping. A random sampling across all interaction types will ensure that all of the services offered at these education and sales centers are evaluated. 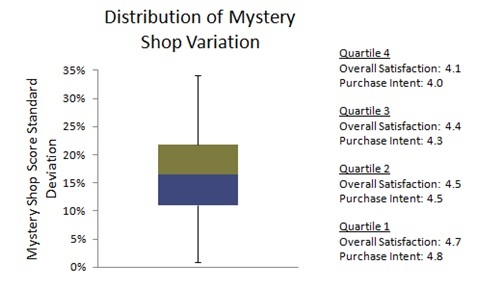 Mystery shopping should focus scenarios on sales scenarios across all retail product lines, evaluating sales effectiveness, quality of experience and compliance. Community Center branches offer the greatest need to refine customer experience measurement, and opportunity to use it as a management tool. Universal associates, with broad skill requirements working in lightly staffed branches, mandate that the customer experience be monitored closely. 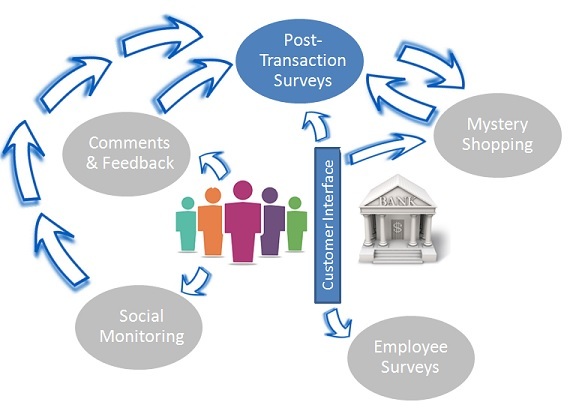 Post-transaction surveys across all interaction types should be used to evaluate employee skill level, appropriate resolution of inquiry, and consistency of service with brand promise. An automated email or mobile survey will provide managers with a near real time view of the customer experience at fraction of the cost of other data collection methods. Mystery shopping across a broad range of scenarios will evaluate employee skill level and appropriate referral practices for mortgage and investment services to Flagship branches or Video Bankers. Fewer employees will allow for better tracking of the customer experience at the employee level, which will be a necessity given the increased expectations on these employees with less onsite management. As with the other branch types, a random sampling of all interaction types will yield a valid sample of transactions these branches perform. As with the other branch types, automated email or mobile surveys will provide a near real time view of the experience. 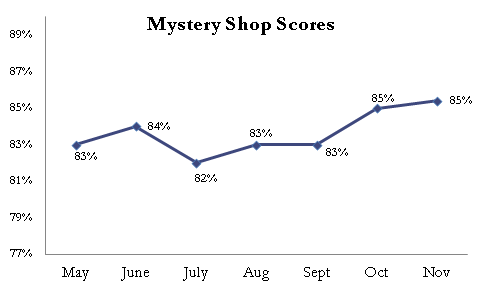 Mystery shopping may be used to evaluate service interactions with video tellers, investment advisors or tellers. Evolution of the branch network, particularly with changes in the staffing model, will require changes in how the customer experience is monitored. The good news is survey technology is evolving as well, and will give managers the opportunity to gather intelligence on the customer experience in a highly efficient and productive manner. Looking for a tried and true model to understand your service quality? The SERVQUAL model is an empiric model that has been around for nearly 30 years. While not new, it is a foundation of many of the service quality and customer experience concepts in use today. It is a gap model designed to measure gaps between customer perceptions relative to customer expectations. Each of these five dimensions is measured using a survey instrument consisting of individual attributes which role up into each dimension. Research without a call to action may be informative, but not very useful. By measuring both customer perceptions and expectations, SERVQUAL gives managers the ability to prioritize investments in the customer experience based not only on their performance, but performance relative to customer expectations. 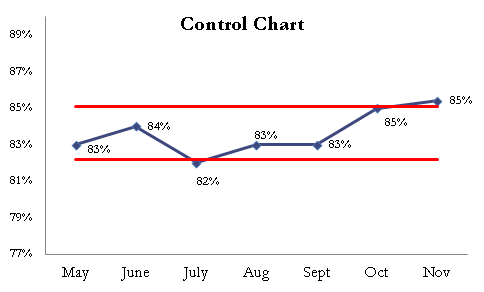 The first step in taking action on SERVQUAL results is to calculate a Gap Score by simply subtracting the expectation rating from the perception rating for each attribute (Gap Score = Perception – Expectation). This step alone will give you a basis for ranking each attribute based on its gap between customer perceptions and expectations. 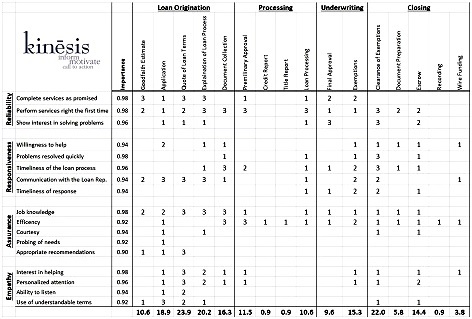 In addition to ranking service attributes, the Gap Score can be used to calculate both a Service Quality Score based on the relative importance assigned by customers to each of the five service quality dimensions. The first step in calculating a Service Quality Score is to average the Gap Score of each attribute within each dimension. This will give you the Gap Score for each dimension (GSD). Averaging the dimension Gap Scores will yield an Unweighted Service Quality Score. From this unweighted score it is a three step process to calculate a Weighted Service Quality Score. First, determine importance weights by asking customers to allocate a fixed number of points (typically 100) across each of the five dimensions based on how important the dimension is to them. This point allocation will yield a weight for each dimension based on its importance. The second step is to multiply the Gap Score for each dimension (GSD) by its importance weight. The final step is to simply sum this product across all five dimensions; this will yield a Weighted Service Quality Score. Click here for a more detailed step by step description of score calculation. What does all this mean? See the following post for discussion of the implications of SERVQUAL for customer experience managers: The 5 Service Dimensions All Customers Care About.